Yes, this is a blog-worthy event. I made breakfast for dinner. 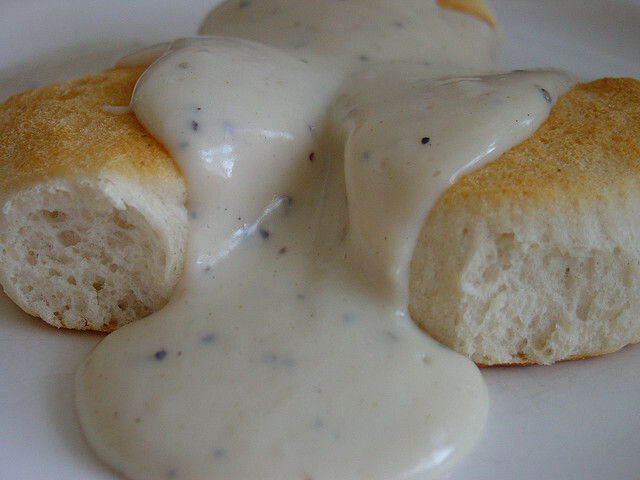 Biscuits — from a can, I admit — and milk gravy. Here in New York City, the term ‘milk gravy’ is greeted with much confusion. So I will explain further in case you are also reading this with your head cocked to the side in bewilderment. In a skillet on medium heat, I browned flour in vegetable oil. (Bacon grease is the first choice, but I didn’t have any.) To the flour, I added milk, stirring constantly over low heat. Now, during this process, there was a lot of adjusting — how much oil, how much flour, how much milk. I even added some water at the end to thin the gravy…plus salt and pepper to taste. But, I must say, the final product was nothing short of amazing. Filling? Yes. Heavy? Oh yes. I even added bacon to the plate, so there’s nothing about this meal that my doctor recommends. But it does a heart good to enjoy such a feast on a good, damp New York City night. Growing up in a town of 400 people (Fancy Farm, Kentucky), we didn’t have a lot of restaurant choices. So, on special occasions like birthdays, my mother would let us choose our favorite meal, and she would cook…because she was a fabulous cook. Fried chicken. Mashed potatoes. Lima beans. 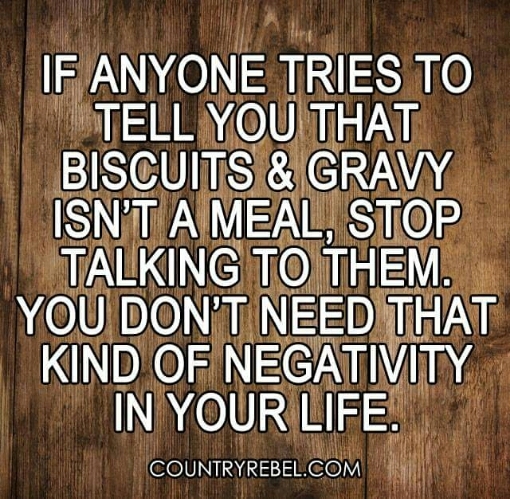 Sometimes biscuits, too. A little slice of heaven on earth…and no one made it better than my mom. 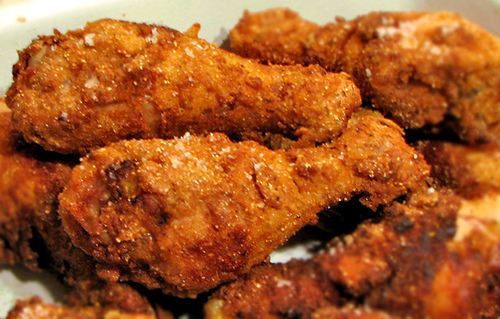 I mention this because it’s National Fried Chicken Day. I never knew July 6th had this designation, or I would have made sure mom cooked my favorite meal that day as well. I would have had the excuse to indulge every year on this day, too, because I don’t eat fried chicken that much anymore. I’m not sure why. It’s high in protein, and the breading really doesn’t add that many carbs to the mix. Where I probably sin the most is in the amount of mashed potatoes I can put away — if they’re smooth and creamy the way I like ’em, I can eat an entire family-size serving. Hope I can find some fried chicken here in NYC…’cause it’s National Fried Chicken Day, damn it, and a Southern gal’s gotta celebrate.